Think your treatment options are limited? Think again. Just take a look at the many available options. We pride ourselves in bringing you accurate, reliable, research-backed information about all your treatment options. Abortives are medicines and therapies that can stop or shorten an attack once it has begun. Abortive therapies are intended to do just that - abort the attack at its onset and stop the pain. One of the most critical factors in effectively aborting a cluster headache is getting the medicine to the problem, fast. Since cluster headaches come on rapidly and are of relatively short duration, medicines taken in pill form are generally not effective. The route of administration of the drug should introduce the medicine to the bloodstream fairly immediately, therefore, medicine by injection or inhalation will provide the highest likelihood of an effective and rapid abort. Preventatives rarely stop cluster headache attacks altogether, but many do help to reduce the number of attacks and/or the severity of attacks.Any treatment that reduces the frequency and/or severity by 50% of greater is considered successful. Preventive medicines for cluster headache are borrowed from other primary indications, including anti-convulsant (anti-epileptic), mood stabilization, and blood and heart medications (calcium channel blockers). 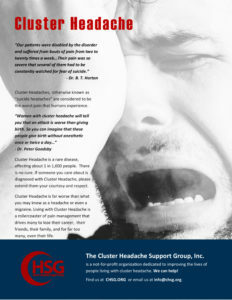 There are no prescription medications specifically indicated for Cluster Headache and there is no drug to cure cluster headaches. Bridging therapies are used to offer temporary relief while preventive treatments take full effect. For brief cycles, bridging therapies are sometimes used as short-term preventives. The most common bridging therapy is a corticosteroid, such as Prednisone, given in a taper (large dose, then diminishing doses) over a period of 1-2 weeks. Another bridging therapy is Greater Occipital Nerve Blockade (GON or GONB). This is administered by your neurologist or by a pain management center. Essentially the approach is to numb the nerve by injecting anesthetics and steroids, thereby blocking the sensation of pain. Alternative therapies are those treatments that fall outside of conventional health care. These treatments may include traditional healing practices, recreational drugs, or simply new ideas that have yet to pass the scrutiny of scientific study. Alternative therapies are often viewed as safer or even without side effects as compared to pharmaceutical treatments. However, this is not necessarily the case. If you are considering alternative therapies, please consult with you headache specialist before making changes to your treatment plan.